Following up on my last post about “Spoonfest” I received a comment from Rod T. regarding the Milan Village Arts School annual “Spoon Gathering” here in the States. It’s been happening annually for a while now and sounds like the kind of get together I could hangout at…or sit around for…depending on how you look at it based on the pictures. Friday is set aside solely for spoon carving time. 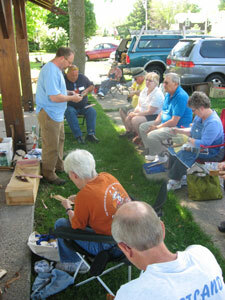 Saturday will be demonstrations from renowned carvers and a potluck party in the evening. Sounds like a great time and an even better excuse to just hangout with woodworking folk and make stuff! For more information visit the Milan Village Arts School Website at www.milanvillageartsschool.org. « Who wants to go to Spoonfest?